It’s no rockstar. It’s no hunkered down sports car either. And no, it isn’t finished in a flash pink or mustard yellow paint shade. Yet, we see eyes veering in the direction of this seemingly un-cool MPV. What? Why? Our maroon Ertiga was the subject of quite a few stares from small families in Altos and WagonRs. A lustful gaze was locked onto this seven-seater by cabbies, followed by some affirmative nodding. Is this the Ertiga that makes the dutiful MPV desirable? Sure, the Ertiga’s wheelbase hasn’t changed at all compared to the vehicle it replaces. The overall length, however, has gone up by a significant 99mm. Add that it’s now wider by 40mm too, and you’ve got a vehicle that feels like a badi gaadi. Yes, when we drove past a Marazzo, the Ertiga admittedly didn’t have the presence that the Mahindra commanded. But, it’s close enough. Added length means more space, right? Not always, but here, yes. Walk inside the cabin and you notice the small nips and tucks made to ensure that there’s more room for occupants. Unlike the old Ertiga’s swoopy, flowy dash, you now get a design that’s a lot more upright. The dash doesn’t stretch out too much either. It sits close to the front windshield which again means more space inside for occupants. With the slightly tall seating position, you’re treated to a confidence-inspiring view all around. You wouldn’t be struggling for room one bit, even if you’re freakishly tall. Where you would scoff and whinge a bit is while finding a proper driving position. We’ve got no complaints with the adjustment range for the driver’s seat. Height-adjust range is more than sufficient, and you can push the seat as far back as you’d want to, too. But, the steering is placed at a slight upward angle. Also, it can’t be adjusted for reach, only tilt. Then there’s the hiccup with the pedals, the angle of which feels a touch upright. So, you find your knees up while using the clutch. If you push the seat behind to fix this issue, you wish the steering had telescopic reach, since your hands are a bit outstretched. Finally, if you’ve got big feet, you’ll feel the pedal box is a bit cramped. There’s a similar annoyance in the co-driver’s footwell too. You end up placing your feet at an angle to be comfortable. In the second row, there’s enough room for a six-footer like me to be comfortable behind my own driving position. You also get the flexibility of sliding the second row backwards and reclining the seat to get some more space to unwind. There’s enough width to accommodate three here as well. That said, you would be brushing shoulders ever so slightly. If the fifth occupant isn’t keen on joining you, you can always flip down the central armrest and relax. This also makes us wonder why the Ertiga isn’t offered in a captain-seat configuration, at least as an option. On that note, the Ertiga also needs a one-touch tumble system for the second row. To get into the third row, you now have to tug at a lever that drops the seatback forward, and you slide the seat forward. Then you (somehow) squeeze yourself between the C-pillar and the seat to get into the third row. This could’ve been a lot easier, no? But once you’re in, it’s a genuine surprise. Grown adults can sit here, and that’s a welcome change. Yes, you’d have to ask the occupants in the second row to slide their seats a bit ahead, but even in that case, you wouldn’t be inconveniencing them. It’s a proper, proper seven seater. There’s absolutely no denying that it’s an immensely practical people mover. We’ll start off with a small request. Can we please get a small shelf on the dash, Maruti? But look past that, and you’re surprised at the amount of storage the Ertiga packs in. Smaller details such as the co-driver’s door pull handle being longer than the driver’s lets you throw in your smartphone for short journeys. In the centre console, you get cooled cup holders too. Right in front of these cupholders is a flat space, that unsurprisingly is the perfect size to hold your wallet in place. You also get a small closable drawer to the right of the steering that can hold loose change, toll receipts and what not. Topping things off is the teeny-tiny storage compartment in the armrest. It isn’t particularly useful (since it’s narrow and deep), but you can use it as a small bottle holder should you want to. Bumping up the practicality quotient are the large doorpads that hold 1-litre bottles happily. For the rear occupants, there’s a shelf to park your phone in while it charges from the 12V socket right above it. Third-row occupants get a 12V socket too, and individual cup holders as well. Misses? Not anything in particular, really. If we were to nitpick, we’d say a pair of cupholders in the rear armrest would’ve been great. To keep the two rear rows cool, there’s roof-mounted vents, right behind the front seats. Like the old Ertiga, you get the blower-speed control as well. It’s disappointing that this important feature has been omitted from the L variant altogether. We’d rather have the AC vents over the standard cooled cup holders, frankly. We couldn’t test the efficiency of the AC (because it’s winter in Pune!) but at full whack, there’s enough gusto in the air thrown out of the vents, that they reach the third row. There’s no separate compressor here, just a system that pulls in air from the front third of the cabin and pushes it out the other end. Also, while we’re talking about the rear AC: Hey Maruti, it’s about time we move past vents from the original Zen, no? Open up the large hatch door and there’s 209 litres of bootspace. That’s as much space as your everyday hatchback, and that’s with all three rows in place. Folding the second and third row (that fold completely flat) gives you access to 550 and 803 litres of room respectively. Translate 803 litres as enough space for two six-footers to sleep beside each other comfortably. That counts as a bonus on road trips! Powering the Ertiga is the same 1.5-litre, K15B engine we first saw under the hood of the Ciaz facelift. Paired with the second-generation SHVS (mild-hybrid), the engine promises enough pulling power without compromising on efficiency. Driven calmly, this motor returned 16.03kmpl on the highway, and 13.40kmpl inside the city. While it’s far off from the ARAI-certified 19.34kmpl, it’s acceptable for a large MPV with a 1.5-litre petrol motor. If there’s one thing the engine is exceedingly good at, it’s the sheer drivability. As Tushar demonstrated, you can upshift your way to fifth gear without ever needing to press the accelerator. It’s the engine making sure there’s always enough of that 138Nm of torque at your disposal. You can slot the car in second gear and treat it as an automatic too if you wish. In heavy bumper-to-bumper traffic, we managed to get a clean pull from a standstill. All said and done, you wouldn’t feel a lack of performance anywhere. It’s adequate, especially if you’re a calm driver. We think the Ertiga makes for a fantastic road trip companion too. It exhibits uncanny ease between 80 and 120kmph, chugging down miles without any hint of drama. Cruise control was sorely missed, though. It’d have substantially bumped up the touring capability, that’s a given. A resounding yes. Unless you happen to be in the third row, with a maniac behind the wheel who’s hellbent on flying over bad roads. Our lensman insisted on being this particular test dummy, and spent the next five minutes complaining. But, we digress. Maruti Suzuki has improved upon the suspension of the older Ertiga. It confidently tackles craters and bad roads, and lets very little filter into the cabin. We like that the suspension settles back quickly once you’re done negotiating the bad bits. It’s this characteristic that makes the Ertiga feel more composed than before on the highway. Hitting expansion joints on the Expressway made nearly no difference to the cabin, the Ertiga simply scampered on. At slow city speeds too, there are no complaints. Even Pune’s table-top speed breakers were comfortably dealt with, without making a noise. That said, don’t mistake this for a setup that’s going to deliver grins when you’re pushing it through the bend. Drive an MPV like an MPV, please. Should you choose to ignore the previous sentence, you’ll be met with body roll. Feeling the weight shift in a vehicle that’s 4.4-metres long doesn’t feel particularly exciting. So, yeah, just don’t do it. Not entirely. You’ll still buy it because you need it, and not want it. But, we see no reason not to cut a cheque. It’s not extraordinary in any dimension, but it doesn’t falter heavily anywhere either. Yes, at this price point Maruti Suzuki should’ve offered side and curtain airbags and set an example. There are glaring misses too, like the driver’s power window not having an auto up function, and rear-AC vents not being offered as standard. You could also wish for daytime running lamps, and bigger alloy wheels too. And yes, the touchscreen is beginning to show its age, with far slicker options available in the market now. Here’s where you get an insight into Maruti’s understanding of the Indian buyer. Whatever one would expect from a seven seater, the Ertiga nails down to the T. Ample space, comfortable ride quality, adequate boot space, acceptable efficiency, and service support like no other. Maruti’s Ertiga has seemingly got it all. Share your experiences with Ertiga 2018? 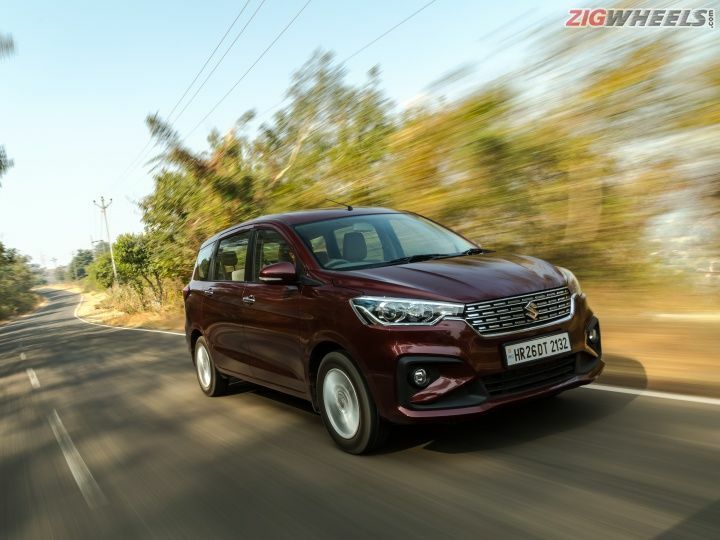 Confused about Maruti Suzuki Ertiga?